Rates your bottom line can't go without! Where else can you stop a cancellation with your smartphone, receive text alerts before an account cancels, and quote additional premiums online? Choose a seamless option to pay online via credit card or check and save more accounts from cancellation. Place a cancellation hold online for up to 5 calendar days, without having to call us. This keeps money in your pocket! No more phone calls for an additonal premium quote. Just enter the additional premium figures, calculate the quote and print or e-sign the agreement. Print the first payment notice and deliver it directly to your customers at the point of sale. E-mail or Text Message your accountholders, 5 days before their cancellation date! This prevents costly cancelations and rewrites. Funding is done via check or ACH and accompanied by a daily report, detailing all transactions. Our system is real-time so you'll always have up-to-the-second account information. Access all account details, including payment history, policy information and previously mailed notices. Participate in the revenue of each financed account through a variety of options. Sit back and relax while we deposit the monies into your bank account each month. Any report or notice can be automatically delivered to your inbox, each morning. All previously printed notices and letters are available online, at any time. You can submit any loan electronically, no fax or e-mail is required! 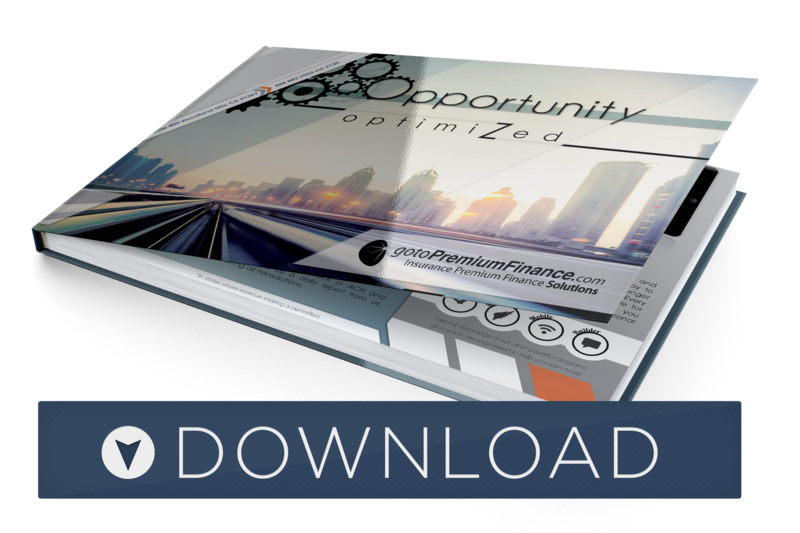 Is your firm truly optimized to earn at full potential? gotoPremiumFinance is a comprehensive business engine that will cut costs and reduce overhead by producing greater efficiency, delivering stronger sales and increased profits. Each operational procedure represents an opportunity to optimize your agency and save money. However, identifying the right ones and turning them into meaningful results can be difficult. That's why partnering gotoPremiumFinance is beneficial. Our service platform is engineered to capture additional business and streamline the billing process, ensuring every piece of our program benefits your revenue model. We help you optimize business to effectively grow your agency's profits. Read our premium finance brochure to find out how we can help you accomplish stable, long-term business growth.